Editor’s note: TUESDAY, April 2 is election day. Only 20% of registered voters are expected to vote. Wouldn’t it be great if our voting districts proved that predictions wrong? See articles #13-16 for what’s on the ballot. WEDNESDAY, April 3, is this neighborhood’s chance to have some input into the art that will be part of the Verona Road Project. Come to the meeting at Prairie UU, 7:30 pm. See article #4. 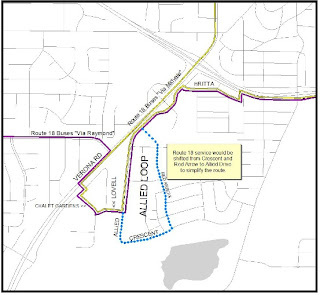 4 - Come Have Your Say on Verona Road Project Art, April 3, 7:30 p.m.
21 - How Do Bike Paths Affect Neighborhoods? Anyone seen our neighborhood turkeys lately? I heard that someone saw one up by the Frontage Road, and when it was spooked by traffic, it took off in a burst of speed, clearing the fence, flying over the Beltline, and landing on a house on Warwick Way. I’ve read that one wild turkey was clocked flying at 55 mph, and they can run at 10-20 mph. Then I heard that people were seeing two turkeys. Finally, neighbors from DeVolis saw an animal control officer trying to catch the neighborhood turkey. The people that reported this weren’t all that happy about the animal control officer. My own thoughts are, any turkey that wants to go back to its flock can probably do so at will since turkeys can run good distances, can easily fly across roads, and and can fly high up into trees. In fact, about a month ago when I was at the Arboretum I saw a flock of turkeys fly up into tall pine trees. They take pretty good care of themselves. Want to know more about turkeys? A good written source online is <http://www.humanesociety.org/assets/pdfs/farm/about_turkeys.pdf > For an inside view of what it’s like to be part of a turkey flock, watch this fascinating episode of PBS’s Nature online called “My Life as a Turkey.” <http://www.pbs.org/wnet/nature/episodes/my-life-as-a-turkey/full-episode/7378/> You will be amazed! Sign #1 - Marlborough Park Community Gardeners signed up for their plots on March 9 and 12. Sign #3 - I finally heard a robin and thought I saw it too in the growing dusk in my yard. This was March 23. Usually I see my first robin no later than March 9. Then on March 26, I saw 3 robins, fat and red-breasted as can be, scratching and hopping on the south-facing bank along McKee Road. Sign #4 - The big orange neighborhood tom cat is yowling in my yard and coming up to sit on my back deck. I think he’s trying to court my cat. Fortunately, she is fixed, so I have no worries. He’s a handsome guy. Sign #5 - Often I’ve heard Sandhill Cranes clacking in their distinctive way as they fly high overhead. On March 14, I could hear them from inside my house, and they went on for a long time. I never could see them. I heard them again on the 17th. Today, March 28, I saw 3 Sandhills flapping slowly as they crossed high above the Beltline. The International Crane Foundations says cranes usually fly 3,000-5,000 feet up, higher if they are crossing mountain ranges. Another site mentions that they fly anywhere from 14 to 51 mpm - often as high as 12,000 feet. I’d say these cranes weren’t higher than 1,000 feet. Sign #6 - A neighbor who gardens in Marlborough Park sent me photos of his seedlings. 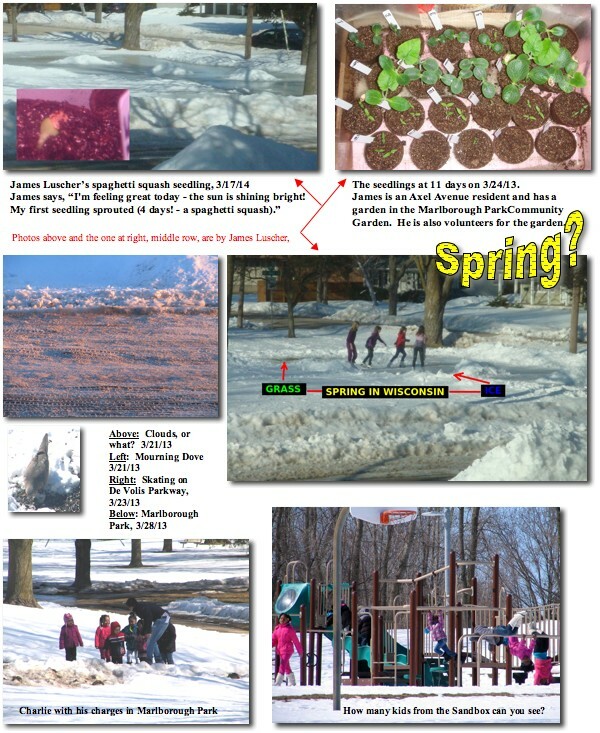 The first of James Luscher’s squash came up in 4 days, on March 17. Another photo from 7 days later shows that many of his seedlings had sprouted. Sign #7 - Today, March 28, I saw a Red-tailed Hawk fly into the neighborhood around Verona Road and light on the arm of a streetlight in front of the Mobil station. I got right under it to get a picture. When it was tired of seeing me so close, it flew away and lit on another streetlight by the entrance to Verona Road. Technically, this isn’t a sign of spring since we see Red-tails all year round, but it made me think of spring. Sign #8 - Today as I was about to get into my car, I heard the excited voices of a bunch of kids approaching Marlborough Park with their daycare teachers. They were aiming for the playground, happy as they could be. I caught a few photos of them with their teachers Samantha and Charlie. I saw another group up by the pedestrian overpass, this time the smallest kids that could walk. Their teacher kept them all well to the side of the street since there are no sidewalks in this area. All the kids were from the Sandbox Daycare on the Frontage Road near the ped overpass. I was happy to see them all out getting a walk on a sunny day in the fresh air. Sign #9 - The buds on the maple trees are huge. 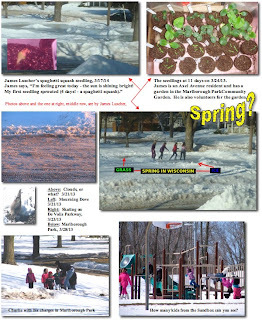 For a potpourri of spring photos, look at the two “pics” attachments. The City Clerk’s Office needs Madison residents to work at the polls on April 2. Poll workers are paid a living wage of $12.19 an hour. A half day shift nets about $100, while a full day shift gets you about $200. · 6 a.m. – 1:30 p.m. Apply online through https://www.cityofmadison.com/election/pollWorkers/pollworker.cfm <file://localhost/election/pollWorkers/pollworker.cfm> . Since May 17, 2012, we’ve known it will be an uphill battle to get community input into any art associated with the Verona Road reconstruction project. But on April 3, 2013, the community will have a chance to learn what’s possible and give opinions on what should be. The meeting will be held at Prairie UU Society, 2010 Whenona Drive, at 7:30 p.m.
Madison’s Arts Administor Karin Wolf will attend the meeting of the Dunn’s Marsh Neighborhood Council for the express purpose of talking with neighborhood residents about art for the project. Representatives from WisDOT and Strand Associates, consultants, will also be present. The community may have a chance to vote on what’s presented. Since last May the DMNA has been consistently working to promote art as part of the project. Authorities verbally held out the promice of art during the planning process prior to that time. In addition, the Final Environmental Impact Statement for the project states that “WisDOT will involve adjacent residents to a considerable degree in developing context-sensitive features, aesthetic treatments, and landscaping during the design phase of the project” and further promised that “WisDOT will establish a budget for context sensitive design and work closely with communities to develop appropriate treatments that address both views of and views from the facility” [the single-point Verona Road interchange under the Beltline]. “Context-sensitive features” refers to things like landscaping, the look of concrete abutments, sound walls, and overpasses, and public art. 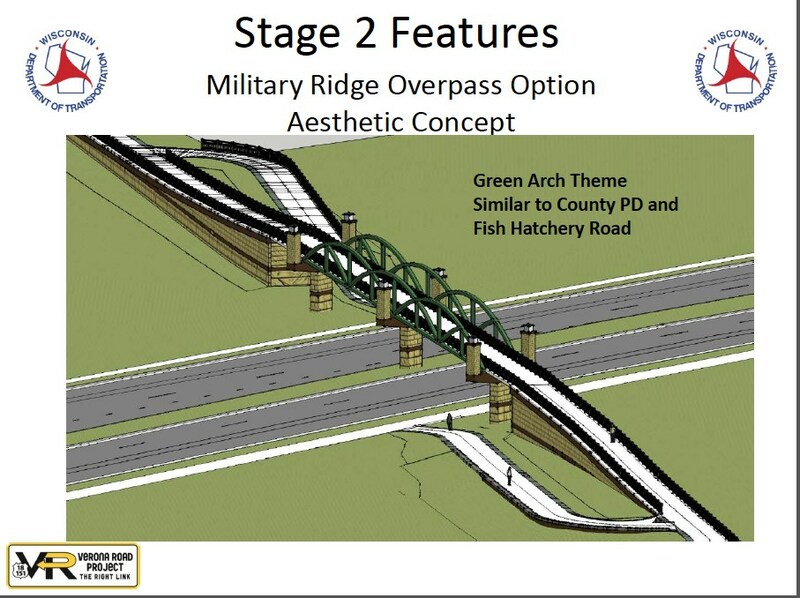 So far, the only input WisDOT asked for was about the surface of the sound walls. WisDOT Project Manager Mark Vesperman said that more people favored the “stacked limestone” look than the other choices that were presented. Many pages of highway murals and sculpture-like art on highway abutments and in pedestrian tunnels were submitted to consultants at the Verona Road open houses held last year. The DMNA has communicated with WisDOT’s Mark Vesperman, WisDOT’s consultant Joe Bunker from Strand Associates, our political representatives, and Arts Administrator Karin Wolf. Now we will see how much that has paid off. Come to the meeting on Wed., April 3, and get your two cents-worth in. The meeting starts at 7:30 p..m. at Prairie UU Society, 2010 Whenona Drive. WisDOT representatives will be available at these meetings to discuss the project on an individual basis. Other important project related information. Please provide your first and last name with your email address. Do not forget to confirm the subscription from your email when the notification arrives. Stay involved and informed with the project website and project Facebook page, www.facebook.com/WIVeronaRoadProject <http://lists.wi.gov/t/813864/1837417/3202/0/ <http://lists.wi.gov/t/813864/1837417/3202/0/> > . The four-way stop intersection of South Seminole Highway and Lacy Road will receive additional turn lanes this summer. On south Seminole Hwy, a turn lane will be added for southbound traffic to travel eastbound onto Lacy Road. Additionally, a turn lane will be added on Lacy Road for westbound traffic to travel northbound on south Seminole Hwy. This project will be coordinated closely with Fitchburg’s Resurfacing contract which includes the resurfacing of Seminole Highway from Lacy Road north to Schumann Drive. A traffic signal will be installed on Seminole Highway at the intersection with Sentinel Pass. The intersection will also be widened to accommodate a northbound left-turn lane for vehicles to continue west onto Sentinel Pass. This signal will improve access into and out of the Belmar and Renaissance on the Park parts of the Dunn’s Marsh neighborhood. Crossing McKee Road on the Military Ridge State Trail will be improved with the construction of a new bridge to get over McKee Road. The new bridge will be located within the same railroad corridor and will eliminate the need for cyclists to go through the Verona Road/ McKee Road intersection. WisDOT will be starting construction on this overpass in July 2013 and expects to have the bridge open to pedestrians and bicyclists in Summer 2014. The City is in the final design process for the Cannonball Path project (a portion of which will be named Military Ridge Path) and construction is expected to begin in Spring 2014. This project includes the rerouting of existing storm sewer from the intersection of Red Arrow Trail and Crescent Road, easterly ~150’ to the east side of the Megan’s Bay Condominiums and installation of a small stormwater pond. This project will help alleviate current flooding concerns as well as control water quantity and improve water quality prior to discharging stormwater into Dunn’s Marsh. Honeysuckle, buckthorn, and box elder were removed from the project area in 2012. DNR has awarded up to $60,000 in grant funding for this project. Sidewalk is also planned to connect from the sidewalk at Apache Pond westerly to the Megan’s Bay Condominiums. ue to a number of issues, Madison Metro Bus System is proposing a raft of changes in bus routes and service. Some will affect our neighborhood in a very major way. They are scheduled to take place in August. Two hearings are scheduled. 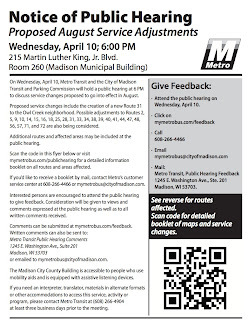 On Tuesday April 10, 6:00 p.m. Madison Transit and Parking Commission will hold a hearing in room 260 of the Madison Muncipal Building, 215 Dr. Martin Luther King Blvd. Fitchburg will hold a hearing the next day, April 11, 6:30 p.m., at the City Hall, 5520 Lacy Road. or written comments can be sent to Metro Transit Public Hearing Comments, 1245 E. Wahsington Ave., Suite 201, Madison, WI 53703. They may also be e-mailed to mymetrobus@cityofmadison.com or called in to 266-4466. 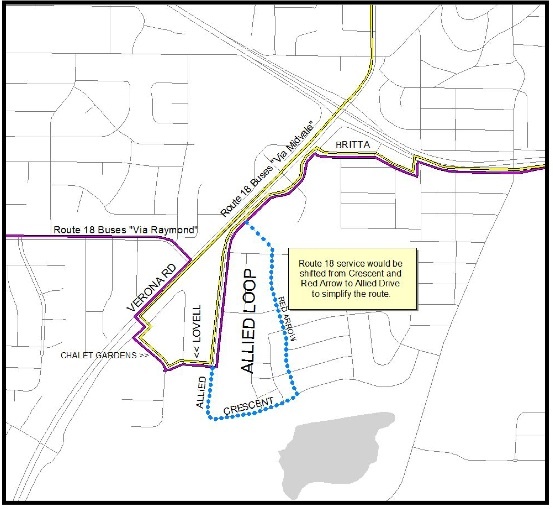 The idea of extending Route 19 has been scratched, and the route for Bus 18 curtailed in our neighborhood. Metro’s current route structure is facing several pressing issues. First, we are struggling to manage an additional 900+ thousand riders that came to the system in a little over a year. Even though ridership is dropping on UW campus routes due to a reduction in service levels, ridership on the rest of the system continues to increase. Second, peak demand has climbed to the point that we are simply out of buses during peak periods. Not only are we out of buses, we are out of space to park buses. As a result, Metro needs to reallocate some peak and even off-peak busesto where they are most needed. We have to look at every trip in the system and decide whether a lightly ridden trip on some route is really necessary — because we could use that bus somewhere else. Routes 2, 9, 14, 15, 28 and 38 are bursting at the seams, and dozens of trips on other routes are very heavily loaded. This route has suffered from chronic schedule issues since its creation in 1998. The basic problem is twofold: First, the South and West Transfer Points are too far apart for buses to travel the distance in the allotted 25 minutes. Second, loads have increased, causing delays boarding and alighting. A review of on-time performance revealed that 22% of the trips on the route cannot maintain schedule; mainly between 7:00 a.m. and 7:00 p.m. One fact lost in that number is the temptation for drivers to speed in residential areas in order to stay on time. This decades-old problem simply had to be fixed, and fixed effectively. 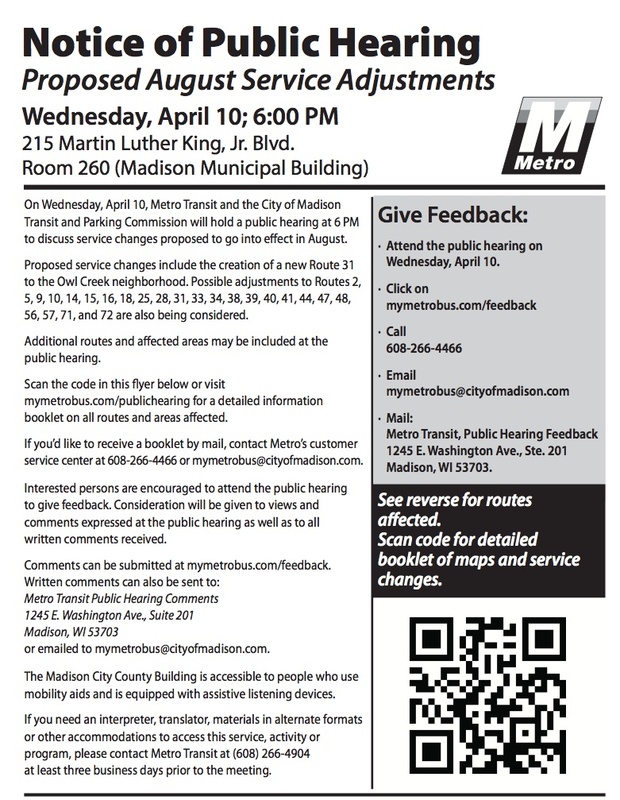 The attachments note the Madison bus hearing and show a map of the proposed change to the #18 bus. The wealth of information delivered by Fitchburg Environmental Engineer Rick Eilertson and Madison Engineer Greg Fries deserves a newsletter of its own. Look forward to receiving this soon. The Allied Community News came out this week. If you’d like to see the issue electronically, send a reply to this issue of the e-News with your request, and I’ll send it. It is 1.6 MB. On Easter Sunday, March 31st, we'll have an Easter egg hunt at Prairie - Prairie UU Society, 2010 Whenona Drive. The egg hunt is for ages 12 and under. Bring a basket if you have one. Join us for a journey to the Jurassic! Here at the Geology Museum on the UW Campus we'll have special displays and activities on what life was like during the Jurassic Period, roughly 150 million years ago. On display for the first time are footprints from flying reptiles, a complete skeleton from a neew species of fish, and a shoulder spike from an armored dinosaur. Learn about preparing dinosaur bones and get a sneak peek at what fossils we hope to discover this summer. Come anytime Saturday, April 6, 9 am- 4 pm.. The address is 1215 W Dayton St . The building is a dark red brick. The Geology Museum is on the second floor. Admission is FREE! promote a healthy lifestyle through exercise and diet. Master of Ceremonies, Channel 15 News Anchor Leigh Mills will welcome all participants and walk them through the event. A fun workout will be planned for all participants to conclude this event. Local fitness centers along with City of Fitchburg Departments will be on hand to provide valuable information on ways to keep healthy and fit right here in the area. sponsors – space is limited so register ASAP. The articles below list the candidates on the ballot in the election coming up on Tuesday, April 2. But how can one find out enough about these candidates to vote intelligently? One way is to read the candidate’s answers in the League of Women Voters Candidates’ Answers. This is a printed resource but is also online. For most candidates in contested races, the URL for their answers is given within the article. Often these candidates also have their own websites which are given right by their photos in Candidates’ Answers. At the time I’m writing this article, I’m also listening to Wisconsin Public Televisions’s Here and Now where Supreme Court Justice candidates Ed Fallone and Pat Roggensack are being interviewed by Fredericka Freyberg. On the same page where I accessed that interview is a section called “Wisconsin News” which offers links to articles about different candidates. The site itself is called WisconsinVote.org. To go directly there, go to www.wisconsinvote.org <http://www.wisconsinvote.org> or copy and paste this URL into your browser. Of course another method is to ask knowledgeable friends who they are voting for and why. Doing any of these things is better than going to the polls ignorant. All of these races are non-partisan. That means that the races are not held under party headings. Therefore, you can’t use party as a guide: none are listed. Here are the elections choices you will see on the ballot whether you are from the Madison or Fitchburg part of the neighborhood. When “incumbent” is printed next to the candidate, that means the candidate already serves in that office. There will be an advisory referendum to indicate support for same day voter registration. “Results of the referendum will help Dane County advocate for same day registration if the state proposes its elimination,” notes our former County Supervisor Carousel Bayrd, now Vice Chair of the Dane County Board. Should the state of Wisconsin continue to allow people to register to vote at the polls on Election Day? Hear a discussion of same day registration on Joy Cardin’s show on Wisconsin Public Radio. Go to <http://www.wpr.org/webcasting/audioarchives_display.cfm?Code=jca >and find the March 28, 7 am show. Milwaukee also has a similar referendum on its ballot. Both candidates live in Madison. See their answers to League of Women Voters questions at http://<www.lwvdanecounty.org/content/dane-county-circuit-court-judge-branch-16> That site also gives their websites. Only Tony Evers responded to the LWV Candidates’ Answers, but you can learn about the positions of both in an article at <http://wispolitics.com/index.iml?Article=292255> which details their differences during a forum on March 13. Court of Appeals, Districts 2, 3, & 4 all have only one candidate, and all are incumbents (presently in office). Of interest may be that the candidate for Court of Appeals, District 4, Paul Lundsten, lives in the Dunn’s Marsh Neighborhood. The Madison 10th Aldermanic District has only one candidate, Maurice Cheeks. The current alder, Brian Solomon, was districted out of our voting district during the redistricting held after the 2010 census. The Dunn’s Marsh Neighborhood is served by two school districts. Residents of Madison voting at Head Start on Red Arrow Trail, are in the Madison School District. Although the ballot will list two candidates for Seat 5, in reality there is only one, T.J. Mertz. The other candidate, Sarah Manski, has moved, and can no longer be a candidate. Please remember this when you vote for School Board. Read each candidate’s answers to League of Women Voters questions at <http://www.lwvdanecounty.org/content/madison-metropolitan-school-district > That online document also lists their e-mail addresses and websites. Sarah Manski is no longer a candidate. She withdrew her candidacy on 2/21/13 since she will be moving out of the state. The Belmar part of the Dunn’s Marsh Neighborhood is in Fitchburg and is part of Fitchburg Aldermanic District 1. District 1 has two seats. Only Seat 1 has a contested race. Both Dorothy Krause, Seat 1 candidate, and Carol Poole, Seat 2 candidate, live in the Dunn’s Marsh Neighborhood. Both are currently in office (incumbents). For Fitchburg Alder answers, go to http://www.lwvdanecounty.org/content/fitchburg-alder or to <http://connectfitchburg.com/articles/2013/03/27/city-fitchburg-candidate-profiles-spring-election> for different questions. Fitchburg is served by the Verona School District, and only one race is contested, the position for at-large candidates. do not smell bad. Rather, they have a pleasant, earthy odor similar to freshly plowed soil. The supplies will be sold on a first come, first served basis. solicit feedback on any suggested improvements from attendees. For information on signing up for Fitchburg’s Rain Barrel Rebate ($5/55 gallon volume), visit our web site (City of Fitchburg). 2. “Sidetracked in the Midwest: A Green Guide for Travelers” with author Mary Bergin - Sat., April 13 (from 2 - 4 pm) - Fitchburg Library (5530 Lacy Rd) - Join syndicated columnist and author of award-winning travel guides Mary Bergin will share her experiences and strategies for discovering overlooked gems on your travels while committing to ecological sustainability. 7. Focus on Energy Announces “Last Chance for Express Energy Efficiency Program for Fitchburg Residents – Deadline Friday, April 12, 2013 – 404 Fitchburg households have participated so far in the Express Energy Efficiency Program that Focus on Energy, MGE, and the City of Fitchburg began in 2012... More information is available at www.focusonenergy.com/express <http://www.focusonenergy.com/express <http://www.focusonenergy.com/express> > . 8. Fitchburg Green Thursday – Fitchburg’s Organics Collection Pilot & Indoor Composting w/ Worms Workshop from Thurs., March 7, 2013 – An electronic copy of this presentation is now available at: http://www.city.fitchburg.wi.us/departments/cityHall/publicWorks/documents/OrganicsPilotWorkshop_2013-03-07.pdf <http://www.city.fitchburg.wi.us/departments/cityHall/publicWorks/documents/OrganicsPilotWorkshop_2013-03-07.pdf> . Recycling handheld electronic devices saves energy, reduces pollution, and keeps reusable materials—and toxic chemicals—out of landfills. Plus, recycling a mineral used in cell phones can reduce the destruction of wild animal habitat in the areas where it is being mined. For each device you drop into one of our Eco-Cell boxes at participating businesses or the Henry Vilas Zoo gift shop, the zoo receives a donation. We pay that donation forward to support the work of global conservation partners that are doing direct work to help conserve habitats and animals as well as save endangered animals. Eligible devices include old cell phones and accessories, handheld electronic games, laptops, digital cameras, e-readers, iPods, MP3 players, GPS, and portable hard drives. Be sure to remove your sensitive data from devices! 1. Concrete pavement that is removed is typically crushed and reused for roadway base material on a project. 2. Asphalt pavement that is removed is typically crushed and reused in the new asphalt pavement. 3. Materials that are excavated are used within the new embankments for a project. 4. The Verona Road project includes a specification to have the contractor allow Habitat for Humanity Restore to review the building demolitions for potential recycling prior to demolition. Contractors also recycle building materials when they can. 5. Steel Reinforcement used within the removed concrete pavements is typically provided to a metal scrap yard for salvage. 6. WisDOT allows the use of recycled asphalt shingles within their asphalt mixes as long as the shingles meet certain requirements. 7. Guardrails, culvert pipes, signs, sign posts, traffic signal poles and light poles that are removed are often provided to County Highway Departments for reuse on their projects and for maintenance of the roadways. EXPLOSIVES available for reuse and recycling range from unused fireworks to unexploded landmines and other heavy propellants, called unexploded ordnance <http://aec.army.mil/usaec/technology/uxo00.html> or UXOs. Generally, explosives are taken to a safety range where they are ignited and the hazardous chemicals are burnt off. However, metals such as brass, steel and aluminum typically remain at the end of the detonation process, totaling up to 60 percent <http://www.resource.uk.com/article/Techniques_Innovation/Explosive_disposal#.UTeD0TB32Sp> of the total weight, and these will be recycled. Technologies are also emerging to convert unexploded propellants into commercial mining explosives <http://www.dtic.mil/cgi-bin/GetTRDoc?AD=ADA498801> and even fertilizer <http://www.arctech.com/PDF/Actodemil/Actodemil%20Technology%20for%20recycling%20energetics.pdf> - proving that even uncommon materials can be put to good use. ACIDS. It probably doesn't come as a surprise that industrial acids, such as oxalic, formic and hydrochloric acids, are challenging to recycle. But technologies are growing to dispose of acids safely without burying them in chemical landfills. By diluting industrial acid <http://water.usgs.gov/admin/memo/policy/wrdpolicy94.006.html> , such as hydrochloric acid common to the steel industry, to 5 percent volume <http://water.usgs.gov/admin/memo/policy/wrdpolicy94.006.html> and balancing it to a neutral pH, the solution is no longer corrosive and can be disposed of down the drain in some jurisdictions. Systems also exist to reprocess industrial acids for reuse <http://eelndom1.ee.doe.gov/OIT/oitpdf.nsf/Files/beta.pdf/$file/beta.pdf> , reducing the need for virgin acids and eliminating the disposal of spent acid and neutralized sludge. FIREARMS AND AMMUNITION. Firearms are often recycled through community gun melts <http://earth911.com/news/2011/10/20/cleveland-melts-firearms-for-public-safety/> , in which unwanted weapons are rounded up and melted down for scrap metal. Metals recovered from gun melts are then used in new products, such as washing machines, car parts and refrigerators. Empty shell casings and other ammunition can be reloaded and reused, as well as being melted down for scrap. In addition to conventional recycling methods, creative greenies have repurposed unwanted armaments and ammunition into loads of unusual products, from jewelry <http://www.hearts.com/p-147-security-necklace.aspx> to building materials for the 2012 Olympic Games <http://earth911.com/news/2010/01/21/stick-em-up-olympic-stadium-will-be-made-of-guns-and-knives/> . Sometimes you hear that putting in a bike path will increase crime at homes adjoining the path. Is that true? A spate of e-mails on the bikies listserve followed remarks by the East Side New Orleans Take Out owner that he would ban Alder Marsha Rummel from his place of business. Why? Because she favored the plan that will put a bike lane on Sherman Avemue and will reduce the traffic lanes to one each way plus a middle turning lane. The owner, whose business isn’t on Sherman, thought his business would be reduced by the change. Bicyclists on the listserve lost no time refuting these remarks. 1. There are documented safety problems [on Sherman Avenue] - for motorists, pedestrians, transit users, and bicyclists. 2. Every study of this type of roadway redesign has been shown to either have no effect or a positive affect on economic activity along the corridor. 3. This project is not closing off any routes. Traffic Engineering estimates that the same volume of traffic will be able to use Sherman Ave after the re-striping. When you have a four-lane road with no left-turn pockets, the center two lanes become de-facto left-turn lanes, so only the outer lanes can be used for through traffic. Local users - drivers - have said that they worried about being hit from behind when stopped in the lefty lane to make a turn. this means some people might not even make that left turn into a business. The center turn lane removes this problem and reduces conflict points for left-turning vehicles from seven to two. The Dunn’s Marsh Neighborhood is blessed with bike paths. Most of the paths are close to the edges of the neighborhood, for example the Cannonball along Dunn’s Marsh, the Capital City Trail south of Dunn’s Marsh, and the Southwest Path running parallel to Carling Drive and Allied Drive. The Southwest Path becomes the Badger State Trail south of its crossing of the Cannonball and Capital City Trail. MADISON – You reply to an online posting for a babysitting job. The client is moving to Wisconsin from out of state in a couple of weeks, so you are finalizing the details of the babysitting arrangement by email and text message. Your pay will be $400 per week. The client sends you an initial check for $1,800 and asks you to cash the check, keep the first week’s payment, and wire the remainder back. Seems simple enough…but it’s a scam. You have been sent a bad check, and once the bank figures it out, you will be on the hook for the total amount plus any penalties. Meanwhile, the scammer is off celebrating with the illegitimate funds you wired. The Wisconsin Department of Agriculture, Trade and Consumer Protection recently heard about a consumer who was in this situation, but recognized it as a scam and contacted the police. Because it can take a couple of days for a check to clear after it has been cashed, victims often do not realize that they have been scammed until well after the excess money has been wired away. In the meantime, they may have also spent a portion of “their share.” As with any other scam involving wire transfers, once the money has been wired and picked up, it is gone for good. · There is no legitimate reason for someone who is giving you money to ask you to wire it back. · The checks in these scams are fakes, but they look real. This can lead to the delay time between when a victim cashes a check and when the bank realizes that it is fraudulent. · You are responsible for the checks you deposit. If you cash a bad check, you will be required to pay the bank back the total amount plus any penalties. Would you want to take the risk of depositing a bad check from someone you do not know? · Scammers often claim to be in another country or to have difficulties with the English language, giving them a reason to ask you to keep all communication in email or text format. It may also give them a reason to have an “agent” that will assist in the transaction, either by sending you the bad check or by receiving the excess funds. · The person will ask you to send back the funds by wire, often overseas. Wire transfers are like handing over cash; once the transfer is sent, it is nearly impossible to get the money back. For more consumer information or to file a complaint, contact the Bureau of Consumer Protection on the web at http://datcp.wisconsin.gov; via e-mail at datcphotline@wi.gov; or call toll-free at 1-800-422-7128. Here’s how to use MedDrop. To dispose of medications in the MedDrop drop boxes, please bring your unused or expired medication and a Ziploc or other resealable bag to the MedDrop police department. Empty contents of pill bottles into a zip lock bag and recycle your pill bottles. Leave liquids, gels or creams in their original containers and place them in a Ziploc bag as well. Put sealed Ziploc bags into the MedDrop box. List of items you can and can't dispose of at MedDrop drop boxes is listed above on the right. Do not bring IV bags; Oxygen Tanks; Nebulizer Machines; Thermometers; Sharps, Epi-pens or anything with a needle or lancet. Earlier this month, MPD (Madison Police district) launched a newly designed website. The new site is designed to be more responsive, and to provide more ways for us to keep citizens updated on what we’re doing. One new feature is the Chief’s Blog, where we’ll share stories about MPD initiatives and activities. Each District page has a Blotter, where we can share district-specific updates with the public. Note that we will be utilizing the Chief’s Blog, District Blotter and Facebook pages to communicate on a more regular basis. 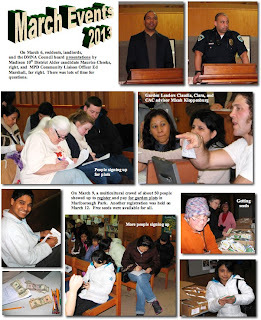 As a result, I anticipate that the District Newsletters will be discontinued. You can sign up to receive email alerts for the Chief’s Blog and District Blotter, to make sure you don’t miss anything. Please contact me with any questions or comments, and thanks for staying involved in your neighborhoods. It turns out, they weren't just telling stories. They were right. Climate change is happening and it’s not just the polar ice caps melting. It’s happening right here in Dane County. Scientific evidence shows several clear trends including an increase in the number of days 90 degrees or hotter and ice now lasting only three months on Lake Mendota when it used to last four months 150 years ago. A 2011 report of the Wisconsin Initiative on Climate Change Impacts predicts that the average temperature is likely to increase 4-9 degrees by the middle of this century and that means the summer we had last year might be here to stay. Scientific evidence tells us that we are going to have more precipitation and higher temperatures with more extreme weather events becoming the norm. We need to prepare now so we can safeguard the wellbeing of residents, minimize economic impacts and protect the environment. That's why I'm creating a Dane County Climate Change Action Council to ensure the county is prepared for extreme weather from climate change. They will review existing emergency plans and issue a report to me with an action list of steps Dane County can take based on projected weather events. I want to make sure county government is ready to respond to any situation that may arise so I am charging this group to make real suggestions for changes we can make to be better prepared. I have also asked my administration to develop a roadmap to further reduce greenhouse gas emissions over the next several years. Marsh Meeting, Tues., March 19, 6:30 p.m. Even if you have never set foot in Dunn’s Marsh or knowingly driven past it, this meeting is for you. It’s also for those who have been intimately involved in our neighborhood gem, Dunn’s Marsh. Tuesday’s the night to come to a special Dunn’s Marsh meeting about Dunn’s Marsh itself. Should be an interesting night with marsh aficionados getting to know each other, experts from both Madison and Fitchburg to give us up-to-date information, a big map to help everyone understand how the natural watershed of the marsh has been enlarged with water piped from elsewhere, and plenty of opportunity to express concerns and hopes about Dunn’s Marsh. Come and bring any friends or neighbors who are interested in the marsh. All are welcome. Reading about the Marsh brings back so many memories of when I was a ”LOT” younger. We kids in the neighborhood use to take our snow shovels or whatever shovels we could find and go down and clean the “Duck Pond” off for skating. It was always known as just the “Duck Pond”….no name back then. One of the neighborhood boys would take a can of some kind of oil or grease and set it on fire to warm our hands. I remember one time when I was out on the ice and the train came down the tracks…..you should have seen me scrambling to get off the ice. One of the bigger kids told us the ice would crack when the train came down the tracks. In the summer time my brothers and other kids would take their fish poles down to fish. It was the place to go to catch turtles, fish, tadpoles or what have you. Now the fish probably would not be “fit” to eat. I want to think the pond was a little deeper then, because some of the kids would also swim there. Even a few wooden rafts were launched from the tracks. When more than two kids would get on the raft, it would sometimes sink, which made for a lot of laughs. A few would make it out to the middle of the pond and eventually “pole” their way back in. We also went up to the Brookwood shopping center to ice skate. The Fitchburg fire station was up there and the Firemen would let us go inside to warm up. Then (you probably remember) they use to flood the park on Britta Parkway. Our kids would go up there to skate. My how things have changed. Could you see kids walking down to the Pond and clearing it off or up to Brookwood or even Britta Pkwy. today to skate. If they don’t have “wheels” to take them or a warming house, they don’t go. Memories…. Also, maybe you know…why isn’t the Marsh ever “dredged out”? Last summer when it was dry (which was the first time I had ever seen that happen) would have been a good time. I am sure a lot of fish died because of the pond being dried out. If it had been a little deeper, maybe it would not have dried out and provided more food for the birds, fish and others that depend on the water for food.